Dashiell Hammett's book reads like a screenplay, and director John Huston knew better than to tamper with brilliance. 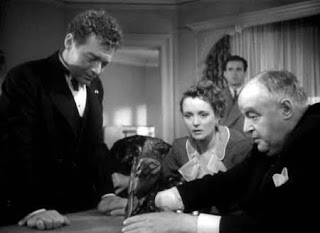 This movie version of The Maltese Falcon is a skillfully faithful adaptation of the story featuring a colourful group of ruthless back-stabbing crooks in pursuit of a precious treasure. Detective Sam Spade finds himself in the middle of the muddle, and has to sort through the mess while keeping himself off the growing list of murder victims. The strengths of the book are effectively translated to the screen. In a star-making role, Humphrey Bogart as Sam Spade defines the 1940's private detective role, all cool under increasing pressure, manipulating diverse characters and cascading events to his advantage despite a shortage of complete information and an even more disadvantageous shortage of guns. The core of the film is Spade matching wits with Kasper Gutman. Sydney Greenstreet creates one of the most memorable villains of the screen, a combination of faux-intellect, cold-blooded evil, and a really large stomach. Surrounding, complementing, and counterbalancing Greenstreet are the effeminate Joel Cairo (Peter Lorre) and the too-tough-for-his-own-good Wilmer (Elisha Cook Jr.). They both add immeasurable depth to the texture of the film. The weak spot of the movie, much as in the book, is Mary Astor as Brigid O'Shaughnessy. Astor, with her weird hair style and wide open eyes, cannot bring any depth or darkness to the unconvincing O'Shaughnessy as created by Hammett, and is simply not believable neither as a villainess nor as a seductress. With a lot of the actual action and murder happening off-screen, and most of the character interaction taking place indoors and through sharp conversation, John Huston creates tightning tension and dynamic movement with his camera angles and framing. There is menace, danger and hidden intent behind every line of dialogue, and Huston, working from his own script, captures it all perfectly. 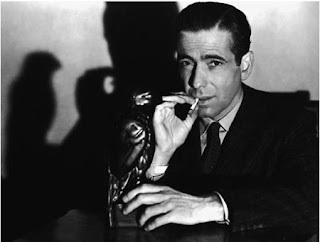 The Maltese Falcon movie, much like the bird at the centre of everyone's attention, is indeed the stuff that dreams are made of.